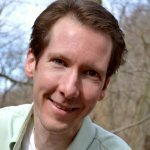 Dr. Robert Lockhart talks about dry fasting as part of his goal of maximizing his body's efficiency in his transformation profile. 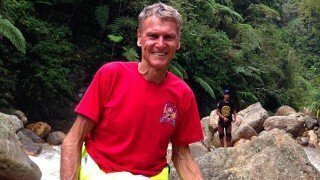 At 70 years young, longtime raw vegan Dr. Robert Lockhart is still “reaching new heights” in health—even if it means getting upside down. Each morning, he walks on his hands—yes, his hands—the length of a football field. 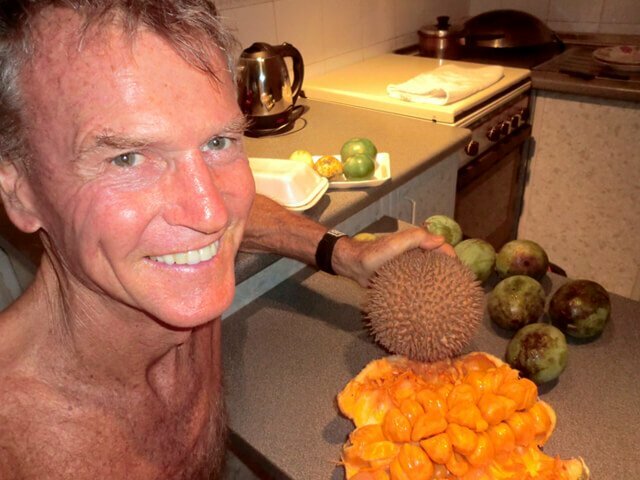 “Your body starts to function more efficiently if you’re subjecting it to trials that keep on pushing us forward,” said Robert, who splits his time between Cairns, North Queensland, Australia, which he says boasts “the greatest variety of fruit of anywhere in the world as far I can see,” and Samal Island in the Philippines. Robert was diagnosed with an arthritic condition in his left knee. He consulted with naturopaths and drugless healers on the Gold Coast, where he had been living, who wanted to give him remedies to alkalize his body, which, they told him, was high in acid. Robert discovered a lecture by Paul Bragg, who was delivering a series of lectures on the Gold Coast. Bragg promoted a lifestyle “in tune with nature,” Robert said. Robert began reading books by Bragg and other raw food pioneers such as T.C. Fry, Herbert M. Shelton, Arnold Ehret and Hereward Carrington. “I came under the influence of Natural Hygiene fairly early on, and so my diet changed fairly radically over a period of about five years, from a high-meat, high-grain, high-protein [diet], also including alcohol, tea and coffee—all the usual Western additives to an unnatural diet, which we’re not physiologically suited to,” he said. 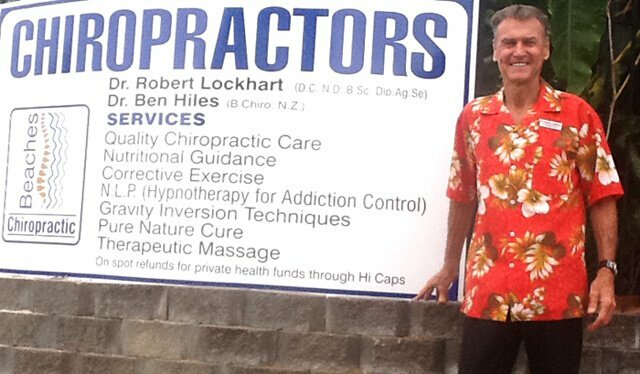 Robert was inspired to become a drugless healer, and to practice in Australia, he learned he had to become a chiropractor. He studied on scholarship at the Los Angeles College of Chiropractic beginning in 1972. He met Dr. Robert Martin, a medical doctor, chiropractor and orthopath. Martin relayed to Robert that all healing takes place in proportion to blood supply, with the more blood one can get to an area, the faster it’s going to heal. Additionally, Martin impressed on Robert that to have a healthy joint, one must have full range of motion. 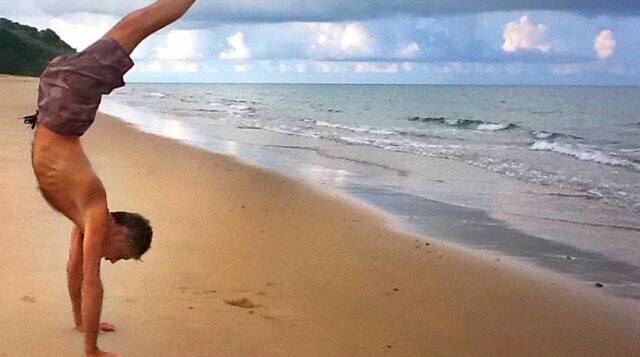 Early into his eighth decade of life, Robert, who operates a clinic as a chiropractor and guides others as a drugless physician, helping them change their lifestyles, runs, practices yoga, performs handstands and exercises in other ways without experiencing any pain. 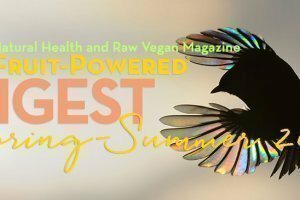 On a raw food diet, which he has led since 1974, he has experienced increased energy and functionality and a clearer mind. Robert’s taken personal responsibility for his health by eating right and keeping in shape. His daily routine is to stretch in the morning, draping his back over a large exercise ball while keeping his feet secured on anchors, and then moving on to handstands. He then does chin-ups and cradle exercises, calling for the inversion of the body, and then core-muscle exercises followed by hand walking. The best single exercise Robert recommends is a handstand, which calls on the body to use 33 times more oxygen compared with walking on one’s feet and flushes the head, neck and shoulders with oxygen instead of just the feet. Robert urges people to offset their occupational activities—calling for many to sit or stand all day—with physical activity that challenge the body in different ways. “No wonder people are suffering from joint and lower-back problems,” he said. Inverted squats and sit-ups are his recommendation for people to break the mold their work position brings them. 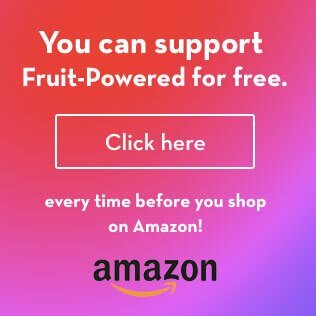 Robert’s exercise routine spans 25 to 40 minutes and is followed by a breakfast at 9 to 9:30 a.m. of fruit such as mango or mamey sapote—usually a monomeal, or one food eaten at a time. At about noon, Robert enjoys another fruit meal, generally two or three bananas with one or two papayas and some passion fruits. He eats another fruit meal, usually a green smoothie (four to five bananas, half a mango or melon and greens such as kale, Swiss chard, spinach and celery) with sprouted coconut, at 2 to 2:30 p.m. Occasionally, especially when he hasn’t consumed greens for a while, Robert adds powdered barley grass to his green smoothies. Robert said that because most eat voraciously after coming out of water fasts, negating the effects of the fasts, people are better suited undertaking regular short fasts such as dry fasts. During dry fasting—about which Robert learned from, among others, Dr. Sergey Filonov of Russia, who helped Chernobyl victims heal—no water is consumed. It is a step beyond water fasting and can be undertaken with the aim to reverse radiation effects, motor neuron diseases and neurological disorders—conditions that often cannot be reversed via water fasting or a raw food diet, he said. Robert said that during dry fasting, the body produces 1 to 1.2 liters per day of metabolic water. Dry fasting can be likened to a fire that burns up toxins in the body, he said. Metabolic water is a byproduct of gluconeogenesis, or the breakdown of body fat to produce energy, carbon dioxide and water, he said. 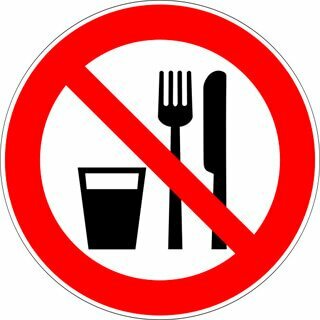 Robert recommends dry fasting only after a person has sufficiently cleansed his or her body through water fasting and a raw food diet for at least two years. Weak organs could be overloaded by the amount of toxins released during dry fasts, he said. Robert’s longest dry fast is four days, and he found the final two days “tough.” Robert observed a Russian man doing a 36-day dry fast, complemented by water enemas—not a full dry fast. “It takes a little bit of determination and a little bit of willpower in order to do it, but once you’re into it, you enjoy the period of no eating more, probably, than the period of feeling stuffed and full because the period of no eating gives you such mental clarity, freedom of movement, etc.,” Robert said. 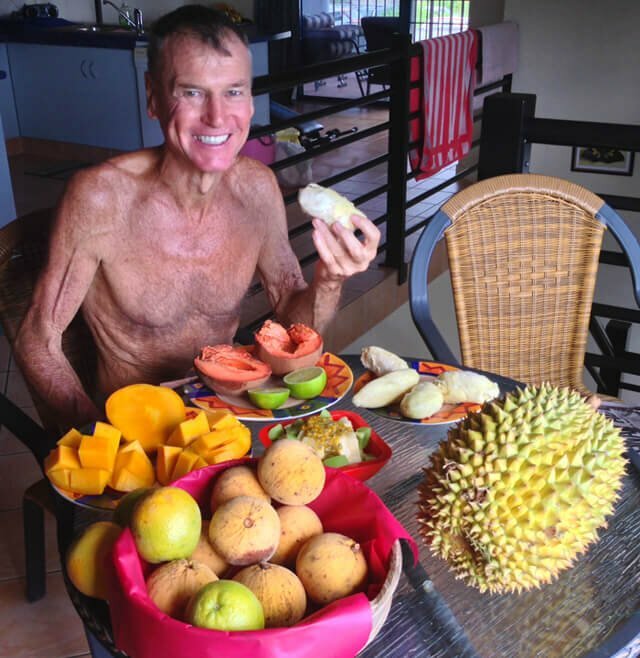 Robert’s favorite fruits are mango, mamey sapote, durian and cempedak. With greens, he reaches for sunflower greens, grown in organic, highly fertile, composted soil, along with celery, spinach, kale, Swiss chard and Kang Kong, or water spinach, grown in Southeast Asia. Robert limits his intake of overt fats, consuming coconut (one to two a week plus sprouted coconuts, which are low in fat and rich in carbohydrates), ackee nuts and very few avocados over the course of a year. With supplementation, Robert occasionally uses a Vitamin B12 spray and barley green powder once every couple of weeks. 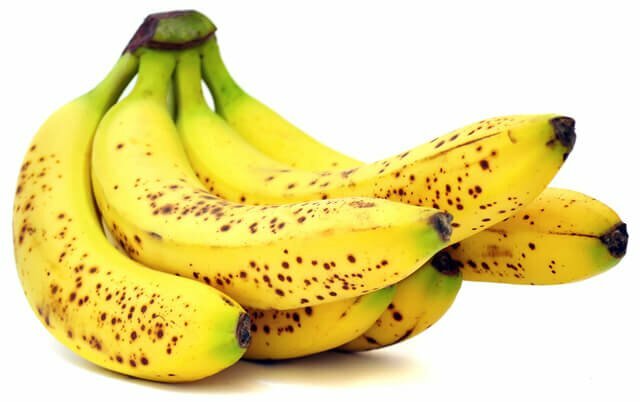 Because soils are deficient, he takes a drop of potassium or colloidal iodine once a day, referencing Don Bennett’s supplementation recommendations. Robert hasn’t had any medical or blood tests in the past 40 years. “I just go by how I feel,” he said. Robert ticks off love, relationships and your connection to the world as a whole as the most important things in life, from what he’s experienced. Robert said that in the past 10 years, he’s expanded his connection to the world by getting out and about more, away from his Australian home base. “I think people are shortchanging themselves if they’re slowing down in their 60s and 70s,” he said, adding that he’s opened up more in life by traveling to Southeast Asia and the United States and meeting many people, including at The Woodstock Fruit Festival. 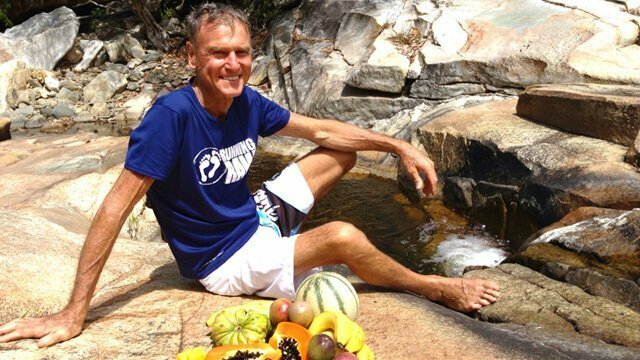 Explore Robert’s YouTube channel and website, SunfoodHealthRetreat.com, for more about this raw food trailblazer. Hungry for more? 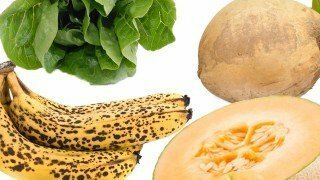 Check out Robert’s Green Smoothie with Sprouted Coconut recipe! Discover Robert’s Top 5 Tips for health! That was a fabulous article! Very informative and inspiring! Thank you! Thanks so much, Angela! I’m glad you enjoyed it! What a great article! Thank you so much! It´s so inspiring, well written and Robert is awesome. I follow him on youtube and this article provides some (for me) new facts about him. Really nice , thanks a lot! 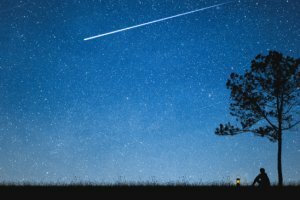 I keep going back to this article as it’s so inspiring! I’m now 14 months into the raw vegan lifestyle eating 80% fruit. And healed myself from all sickness. You are a true inspiration Dr. Robert. Thank you! I have just completed a 12 day grape fast 🙂 Life is excellent.